Time to look at mPortfolios options through the ePortfolio solution first. Listed below are some popular ePortfolio options, certainly not exhaustive, but cover a broad spectrum. I’m interested in how each platform can be accessed, edited, added too etc from a mobile device, once again specifically the iPhone or Touch, but will also add in info on other mobile platforms if available. WordPress (Edublogs): As mentioned in my previous post, any WordPress (version 2.7 or higher) powered blog/eportfolio is can be easily added to through the use of the WordPress iPhone app which works seamlessly when adding new pages or posts with images. 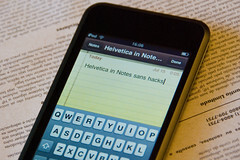 Viewing and adding comments/feedback to the eportfolio requires the use of Safari on the iPhone. However some sites have been optimised for use on the iPhone, often through installing an iPhone friendly theme such as WPTouch allowing the browsing commenting and administering of the site a simple pleasure! (this site has WPTouch installed so check it out on your iPhone/Touch). With a little work from the WordPress web host to set up the something like WPTouch (wordpress.com has, edublogs hasn’t, self hosted is up to the owner) mPortfolios are well catered for on the WordPress platform. Andriod WordPress app info here, Blackberry info here. WPTouch supports both. Google Sites: As part of your education addition or a personal account, Google sites offers another great eportfolio option. Google have an iPhone app which easily sets you are to connect to your google suite of apps, but not sites. Using Safari you can easily access your sites the traditionally way to edit and add new pages and posts. You can also insert images through pasting in thecURL but a lot of the features like inserting a Picasa image, document or calendar does not function well mainly due to the lack of Flash (?) support on the device. No really an enjoyable experience without having an iPhone/mobile optimised site like much of the other Google apps. Blogger: If your eportfolio is a Blogger/Blogspot (also supports WordPress, Joonla, Drupal, MoveableType and more) blog then look no further than the app mentioned in the previous post, BlogPress. Easily the best option for creating new content and has the added feature of allowing YouTube video embeds. It is a shame it cost the extra money to get all of these extra features but the free version does the basics well. Commenting not catered for and Blogger is not really mobile friendly. I am still playing around with themes and layouts to find the best combination for a mobile friendly site. The best way is perhaps to view the site’s RSS feed rather than the web page, this utilises the iPhone/Touch’s built in RSS reader (go to reader.mac.com in mobile Safari if you are not familiar with this feature). Bookmark the feed to revisit the portfolio on the device. Elgg: Like most eportfolio tools and certainly a lot of those listed below, Elgg can be accessed through the iPhone/Touch’s Safari app. Editing and adding content is not without problems (in v 1.6). Creating a new blog post is easy enough and adding the title OK but I was unable to enter any text in the body. However, searching through the Elgg community discussion forums there is some development in making iPhone specific themes and even a iPhone app to make accessing an Elgg site better. The user community for Elgg is nowhere near as big as that of blogger or WordPress but it is exciting to see that there is interest from the user base to get this type of initiative underway. That’s great use as I am a big fan of Elgg. Blackboard: (Untested) I have no working knowledge of using Blackbaord as a portfolio platform but after reading an eportfolio report recently it was one of the most popular options. I have not tested it but have included here after reading that they have an iPhone app that they will custom build to fit your requirements: “Our open platform also lets you build and add your own applications so you can tailor Blackboard Mobile in the way you see fit.” Available for the iPhone/Touch and Blackberry. Potential here? I do know enough to say one way or the other. PebblePad: (Untested) From the website: All installations of PebblePad include a version of Pebble Mobile. To access your mobile version of PebblePad simply point your mobile browser at your normal PebblePad URL and add ‘/mobile’ at the end e.g. : http://www.pebblepad.co.uk/eportfolio/mobile. Plans are seemingly afoot for an iPhone app: We are currently developing a PebblePad iPhone app which will allow users to work with PebblePad on the move. Features currently include viewing your assets, uploading a file, creating a thought and posting this to a blog. This is still an ongoing project due for release in the very near future (PebblePad Newsletter, 10/2009). Sounds great! Have also not tested the following options: KnowledgeNet, My Portfolio/Mahara, UltraNet. (I do not have access to try some our the the time to try the others but will attempt to try). As with the other options, I would image that Safari on the iPhone allows surfing of these sites and editing facilities as per a standard web browser with perhaps some limitations… please confirm if that is not the case! To wrap this post up though it is pretty clear that the eportfolio tools that have a specific app such as Blogger or WordPress have a big advantage over those that don’t. However this experience is not complete until the eportfolio host has taken some measure to also make the eportfolio system mobile friendly to aid viewing and commenting while on the go. While this and a dedicated app is not absolutely required, it makes the process of uploading and sharing learning and receiving feedback on that learning very easy and helps contribute to a collaborative eportfolio from a mobile phone. Just to follow up on my last post, just read this article discussed in Ubiquitous Thoughts, a blog dedicated to thoughts and ideas about teaching, learning, and ubiquitous computing. Having just made my breakout selections for uLearn 08, I was pleased to see 3 sessions dedicated to the use of mobile phones and other portable technologies. I am particularly interested in this breakout: Using the I-Pod touch to instantly inform parents of their child’s learning… by Paul Wright. I see a huge potential in how mobile technologies can contribute to this area and it relates closely to some of the core beliefs I have about ePortfolios. The ability to share, for the purpose of receiving relevant and constructive feedback to improve learning, can only really happen if the learning is shared or made available almost immediately. The web can make his happen. A blog post with embedded media takes minutes and then it’s there, ready to share. But a web based portfolio does not necessarily mean that parents will view it and share in the learning. And if they do, will they leave a comment? Will they view the learning with their child? The physical presence of a portable device, like an iPod touch, could significantly change this. 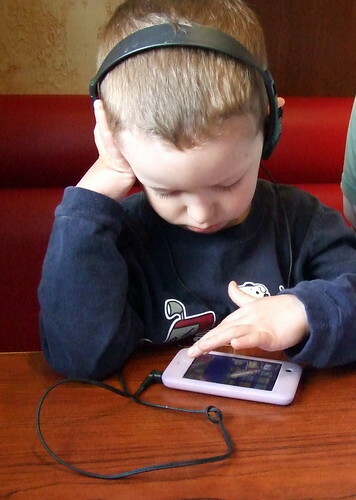 A child bringing home an iPod containing their learning gives an opportunity for sharing, not dependent on a broadband connection, taking only on a few minutes of time with mum or dad. Feedback is instant. Praise here and a suggestion here. Done. If I think of a typical Year 3 child that takes home a reader to read with mum or dad. Why not slip an iPod Touch into the reading folder too and share some learning? I look forward to this breakout to see how successful the pilot programme has been. An interesting article in the New York Times, Welcome, Freshmen. Have an iPod, highlights the increasing occurrence of students being given iPods or iPhones to assist in their learning and help facilitate course and school administration. Basking in the aura of a cutting-edge product could just help a university foster a cutting-edge reputation. And good on them. Why not take advantage of the way students want to learn and do learn in the ‘informal’ manner of social networking, interaction and sharing? Four institutions have indicated that they would be issuing iPods or iPhones to new students this semester. There are plenty of others who are actively investigating the use and trialling it in smaller numbers. One of these is the already established iPhone programme at ACU. Reactions to these exciting initiatives are unfortunately mixed, as one can imagine if you cast your mind back to what university lectures were like for you! Feeling threatened anyone? Robert S. Summers, who has taught at Cornell Law School for about 40 years, announced this week â€” in a detailed, footnoted memorandum â€” that he would ban laptop computers from his class on contract law. â€œI would ban that too if I knew the students were using it in class,â€ Professor Summers said of the iPhone, after the device and its capabilities were explained to him. …that professors might try harder to make classes interesting if they were competing with the devices. â€œWe had assumed that the biggest focus of these devices would be consuming the content,â€ said Tracy Futhey, vice president for information technology and chief information officer at Duke. 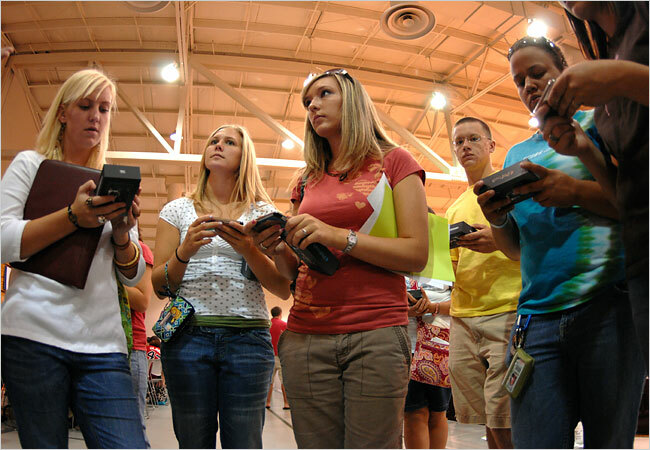 The debate of using mobile phones in education is ongoing. I see their use as inevitable and look forward to being in a situation where I can utilise them. But I am not an expert in this field, just an interested observer. I have blogged previously on how I think the iPhone would make an excellent tool for accessing and creating your eportflios, but it would best to click one of the links below! Firstly, you might like to point our browser here to read a summary of How mobile phones help learning in secondary schools by Dr Elizabeth Hartnell-Young or download the full research report, to get her expert opinion. 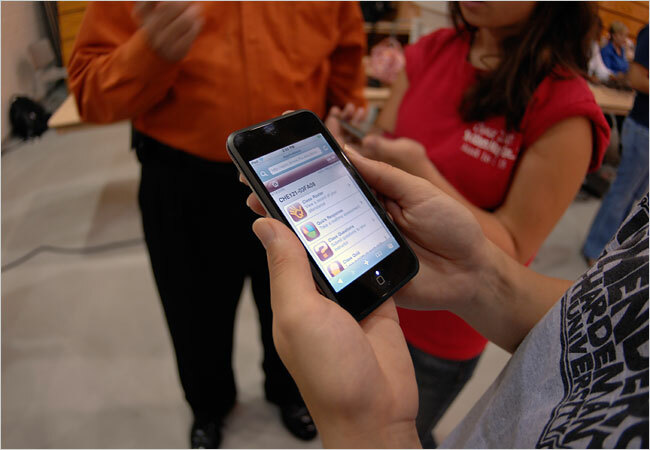 Alternatively head over to another 2008 efellows blog to get ongoing insights into how mobile technologies can enhance the learner experience. I read and watched with interest the news about the VIA Open Source Notebook on the TechCrunch blog. Open source software and now open source computers. Love the 2 way camera! While I am a through and through Mac user and always have been, it seems as though there is a gap in the Mac market for the void that I want to fill. That is to have a small portable tool enabling the ePortfolio to transform, or additionally become, what people may refer to as a Personal Learning Environment (refer to Graham Attwell’s blog for his take on PLEs.). True anywhere anytime cost-effective portability for learning, sharing learning and social communication. The mini laptop seems to be the right tool for the job. Small, virtually no footprint, portable (i.e. throw it in your backpack). For me the concept seems to fill the gap between the MacBook and the iPhone. That is, a small portable device that can access all the Web 2 tools the students use as well as record still and video, project to a projector, wireless, bluetooth… an all on one solution that is small, lightweight and portable and does not require a highly expensive mobile broadband account as a mobile does. And it is cheap! I hear you say, “But it’s not a Mac!”Â Does that matter anymore? I exclusively use Web 2 tools for the majority of my work. Whether I use Linux, Windows or OS X it does not effect the tools I use on the web.